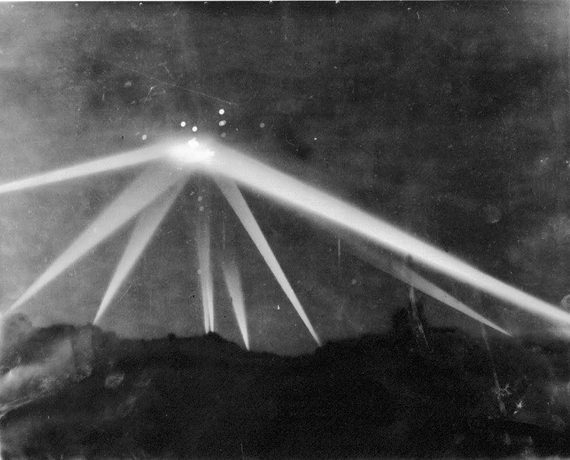 Feb 24, 2015, Huffington Post -- Today marks the 73rd anniversary of The Battle of Los Angeles, also known as The Great LA Air Raid, one of the most mysterious incidents of World War II -- and one of the most colorful tales in all of UFO lore. It's also a tale we couldn't resist turning into a movie. Between the late evening of February 24th, 1942 and the early morning hours of February 25th, the City of Angels flew into a panic as what were initially believed to be Japanese enemy aircraft were spotted over the city. This suspected Japanese raid -- coming soon after the Pearl Harbor bombing, and just one day after a confirmed Japanese submarine attack off the Santa Barbara coast -- touched off a massive barrage of anti-aircraft fire, with some 1400 shells shot into the skies over Los Angeles during the frantic evening. Strangely, however, the anti-aircraft shells hit nothing. Despite the intense barrage, no aircraft wreckage was ever recovered. 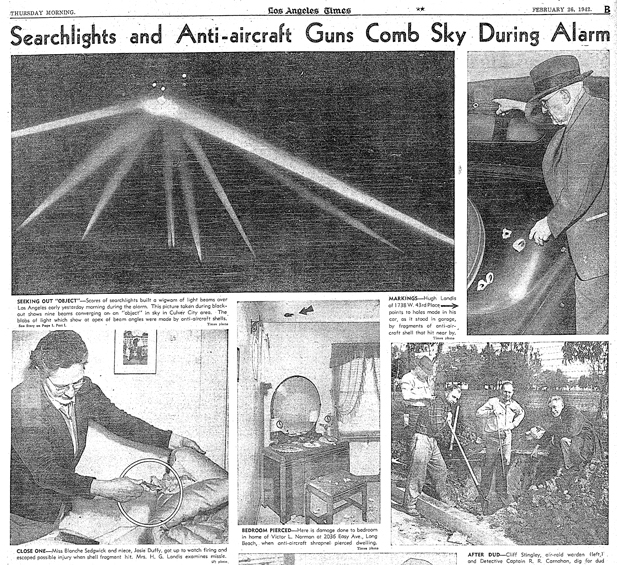 Indeed, once the smoke had cleared and Angelenos calmed down (the public panic over the raid was mercilessly satirized by Steven Spielberg in 1941), no one really knew what had been seen in the sky or on radar. Were they weather balloons? German Zeppelins? Trick kites designed by Orson Welles? Many people believed the aircraft they'd seen was extraterrestrial - one eyewitness even described an object he'd seen as looking like an enormous flying "lozenge" - and some accused the government of a cover-up. Conflicting accounts of the incident from the Navy and War Departments didn't help clarify matters. As if to confirm public fears of extraterrestrial attack, one famous L.A. Times photograph (see above) emerged from the incident showing an ominous, saucer-like object hovering over the city. This much-debated photograph inspired America's first major UFO controversy -- a full five years before Roswell. To this day, no one knows for sure what flew over Los Angeles that night and evaded the city's air defenses. But since it's more fun to assume that it was aliens than weather balloons, we decided to honor The Battle of Los Angeles by dramatizing it in our film UFO Diary as an encounter with the unknown. And as a special treat for UFO enthusiasts and history buffs, we're releasing the trailer for UFO Diary today. UFO Diary also honors the contributions of the 350,000 women who served in the US military in WWII. The film tells the story of a Women's Army Corps (WAC) Captain (Govindini Murty) who, assisted by a WAC First Lieutenant (Rachel Clark), fights the alien invasion with pluck and ingenuity, shattering stereotypes about women's roles. The full version of UFO Diary will be released soon and features editing by Emmy Award-winning ABC editor Mitchell Danton and visual effects by such talented artists as Antony Vannapho (The Twilight Saga), Kiel Figgins (Avengers: Age of Ultron) Sean Dollins (Prometheus), Rini Sugianto (The Hunger Games), Delano Athias (Polis), Bren Wilson (Paradise Lost), and an array of others. Of course, if you're a movie fan, you already know that LA has been invaded countless times over the years in blockbusters like War of the Worlds, Independence Day, Transformers and V. Indeed, no other city -- other than perhaps Tokyo -- has suffered more on-screen calamity at the hands of extraterrestrials than Los Angeles. Maybe LA deserves it. Whether because of the sunshine, the celebrities, the botox or the generally laid-back lifestyle, Angelenos have been drawing the wrath of their fellow Americans for generations. But on one winter night during war time, 73 years ago today, wrath descended from the skies in the form of a UFO, seen by hundreds of thousands of Angelenos - and there was nothing we could do to stop it. Did a UFO really invade Los Angeles in 1942? Look at the evidence - and decide for yourself. The Battle of Los Angeles, also known as The Great Los Angeles Air Raid, is the name given by contemporary sources to the rumored enemy attack and subsequent anti-aircraft artillery barrage which took place from late 24 February to early 25 February 1942 over Los Angeles, California. The incident occurred less than three months after the United States entered World War II. Initially, the target of the aerial barrage was thought to be an attacking force from Japan, but speaking at a press conference shortly afterward, Secretary of the Navy Frank Knox called the incident a "false alarm." Newspapers of the time published a number of reports and speculations of a cover-up. 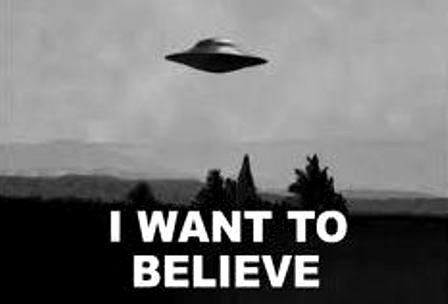 Some modern-day UFO-logists have suggested the targets were extraterrestrial spacecraft. When documenting the incident in 1983, the U.S. Office of Air Force History attributed the event to a case of "war nerves" likely triggered by a lost weather balloon and exacerbated by stray flares and shell bursts from adjoining batteries.